I'm starting a regular blog series on the books I review. I plan to review only books I like because that's my perogative :) I hope they help you add some great titles to your TBR list! Without further ado, here's my first review! Itching for adventure, Miami private investigator Shane Connelly heads for Swan Creek in North Carolina wine country. But she quickly discovers it's anything but the perfect spot to while away the summer months. Her country home turns out to be a burned out hovel that she suspects is haunted. Discouraged, she plans to head home when a handsome stranger arrives at her doorstep. Before she can beat a trail off the mountain, Shane and her handsome neighbor Jesse are inexplicably drawn together as they dodge bullets, unearth ghosts, and unravel a dark town secret. In the end, Shane realizes it's not the high altitudes that are making her head spin, but her brooding lover with the penetrating dark eyes. 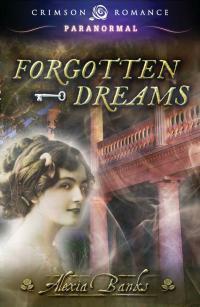 A great romance, intriguing suspense, and a nice dose of humor make FORGOTTEN DREAMS an enjoyably entertaining story. The story grabs you from the first page and keeps you hanging on until the end. Despite the burned out home Shane obtains as payment for PI work, I loved the slice of North Carolina wine country the author introduced me to. I felt like I walked in Shane’s shoes as she investigated the hauntings and secrets of her new home and of Swan Creek.The plot and character motivations are believable, leaving you cheering for Shane and Jessie throughout. Spiced with a supernatural flare and a surprise ending, FORGOTTEN DREAMS is sure to please a wide variety of fans. The cover art is beautiful and a wonderful depiction of the story. I would have picked this book to read based on it alone! (I received a review copy from the author in exchange for a fair and honest review).